Memorial services for Ed Wright will be held at 3:30 p.m. on Friday, November 30, 2018, in the Ninnekah First Baptist Church. The family welcomes all the community kids to attend. Edgar was born November 17, 1939, in Pushmataha County, OK, to L.B. and Grace (Wolf) Wright. 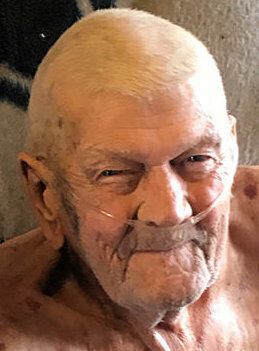 He entered Heaven's gates at 4:17 a.m., Tuesday, November 27, 2018, at his home in Ninnekah. He grew up and attended schools in Texas and Oklahoma. He was deemed legally blind as a young man, but that didn't slow him down. He worked at his father's service station, in roofing, and was an excellent mechanic. Edgar married Joyce McKinney on January 18, 1960, in Chickasha. This union blessed them with five daughters: Karen, Sharon, twins, Karla & Sharla, and his baby, Lynda, then in 1981, he finally got his son, Buddy. In 1976, Ed moved his family to the Ninnekah area. He loved working outside, fishing, welding, piddling, tractors, and wheelin & dealin. His world revolved around his family. He has always had a passion for kids which is what started his popsicle route. After he got his scooter, he started going around taking his grandkids popsicle, which turned into a two mile, 20 to 40 popsicle a day route. That route was his priority for many years; come 3:30, he was out the door, and everything else was forgotten until he was back in his recliner at 5:00 o'clock. He lived for that route and he has missed the kids terribly since he hasn't been able to get out. Ed was preceded in death by his parents; daughter and son-in-law, Sharla and Bill Malone; great-granddaughter, Londyn Green; three brothers-in-law: Aaron McKinney, Don Cumins and Carol Hubbard. He leaves behind the mother of his children, Joyce Wright; four daughters and sons-in-law: Karen Flowers, Sharon & Scott Mitchell, Karla & Ron McAdoo, and Lynda & Mike Pollock; mother, Julia Wright; nine grandkids and their families: Lavicia (Makila) Mitchell and Bobby Oliver, Edgar & Aricka (Jordyn, Brooklyn, Kyndal & Kasyn) Green , Aaron (Autumn) Shaw, Jennifer & Brian (Landan, Rylie, Zoey & Jaxon) Hobbs, Karlynda & Benny (Lexi) Creech, Kelcee & Beth (Landin, Lukus & Bo) Turpin, Zacharee & Jessica (Gracynn) Turpin; two step grandsons: Jason & Sara (Brooklyn) Pollock and Trevor Pollock; two brothers: Hal & Renae Wright and Cecil & Virgina Wright; four sisters and brothers-in-law: Betty Norman, Margie Hendrix & friend, Thomas, Jo & Don Hines, Muriel & Earl Berryhill; brother-in-law, Ron & Jeannie Self; sisters-in-law: Kayla McKinney, Linda & Rick Hill, Kay Hubbard, Karen Cumins; and an abundance of nieces, nephews and extended family. Cremation arrangements are under the direction of Whitt Funeral Home, Duncan, OK.